We received 16,776 EUR on our special account for the assistance in natural disasters, predominantly from Bosch employees. Robert Bosch GmbH donated an additional 20,000 EUR. Therefore, Primavera could support three aid projects in Bosnia and Herzegovina, Croatia and Serbia with the total amount of 37,500 EUR. Every Bosch organization in the respective country identified one project, which received funding of 12,500 EUR. More than 100,000 houses, about 200 schools and many hospitals are destroyed. The Hastor Foundation aims to make approx. 200 houses habitable again and to provide a home for many people. The town of Paracin and its 32,000 inhabitants are affected by the flood in particular. Major clean up is already done and now the recovery of the local economy is very important. Together with the "help for self-help" organization, small business owners are supported in the reconstruction effort. In Croatia, the state of emergency was proclaimed in several regions because of the flood. The region of Gunja, in which 4,000 people live near the rivers Sava and Danube in eastern Croatia, was particularly hard hit. More than 1,600 homes were destroyed. Here we support the targeted reconstruction through our donation to the relief fund of the municipality of Gunja. The fundraiser "Balkanflut" is now completed with the transfer of project funding. Buy it, sell it, love it! Get your watercolor and do something good. During our last garden party we created the idea to auction a painting prepared by the KSF group Stuttgart. Therefore we intended to set-up a public auction platform which ensures, that the money really arrives Primavera; we set-up a Primavera account at ebay and checked the process. Now really everybody can participate! The participants of the Bosch Junior Managers Program invite for a special evening with the Jazz Orchestra of Bosch. All donations and revenue from the catering are donated for Primavera projects completely. Besides the cultural aspect, of course also for your physical well-being will be taken care of. Unfortunately, only a limited number of seats is available, so that we will raffle the seats among all applications again. For registration use the link below. Date: Tuesday, December 09th, 2014 at 6 p.m. So register quickly - in recent years the tickets were awarded within a few hours! On July 19, a warm and sunny day, the Primavera Summer Festival took place at the Bosch Haus Heidehof in Stuttgart. Christoph Kübel (G13), chairman of Primavera, warmly welcomed all guests and spoke about the good donation result in 2013, due to which more than 30 Primavera Projects are being supported and promoted sustainably this year. He also spoke about the portal Bosch Connect with the new link to the Primavera community. The response is great and within a short time more than 1,200 participants have subscribed for regular information about the activities of Primavera. Some of them have opted for a Primavera membership. Currently Primavera counts 810 members. He finally wished all guests a carefree afternoon. Numerous Bosch cultural, sporting and recreational groups provided ​​for exciting entertainment, trivia and features a games course for a lot of fun. The art group children could learn painting under guidance and admire the work of other children. Another group gave technique enthusiasts the possibility, to simulate children Flights from model boats or aircrafts on the PC. The children had great fun in the sack race, throwing and rifle on a hockey slalom and then there was but a very special flying object - the Bosch Copter. The Department informed interested visitors and presented different models. Of course, the Bosch All Stars provided for a groovy atmosphere with snappy songs. A wide range of delicious foods supported personal wellbeing: Grilled specialties, pizzas, delicious cakes and of course with refreshing drinks. In the end it was a really nice, relaxed day. Due to the hot temperatures, the number of guests was slightly lower than in previous years, but the result in favor of Primavera was very gratifying with more than 5,000 euros. Here, the raffle was again a great success - and not just because of the great raffle prizes, but just for the "good cause" - Primavera - Help for children in need. A big thank you to all guests, soloists, actors and helpers! On April 7th, a team of members of the Bosch Junior Managers Program ( JMPler ) had invited to the Bosch Haus Heidehof for this year's first benefit concert. Thanks to the beautiful spring weather, everyona could enjoy the late afternoon with the beautiful ambience in and around the house. Sepp Herzog ,director of the BoJO, came up with a great selection and mix of songs for this evening and a well-prepared band. The organizers welcomed the 200 guests warmly and informed about the contents of Primavera - and then it was already time to get started with the C -Jam Blues by Duke Elllington and two great solos on the piano and tenor saxophone. There were other jazz classics such as Miss Fine, Satin Doll and For Once In My Life. Then Miriam Angstmann, well-known beyond the borders of Stuttgart as a singer, excelled with With me you're beautiful and Save The Last Dance. 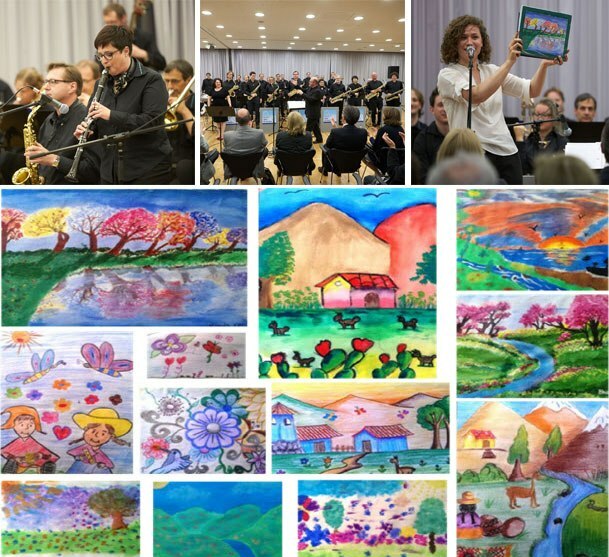 Children from four Primavera aid projects in Brazil, India, Colombia and Peru had painted 100 spring-themed images, which were on display in the foyer. Six motifs could be auctioned for the benefit of Primavera and provided additional revenues of 175,00 EUR. All this had been arranged the JMPler team. After the break followed titles such as Take The Train, Beyond The Sea, All Blues with "muted" trumpet sound and Summertime. A completely different rhythm awaited listeners with the Tequila and Miriam Angstmann then showed again her skills with Do not Know Why, Street Life to the absolute highlight of the evening: Skyfall by Adele. The guests were delighted and paid tribute to this with a huge round of applause, which the BoJO elicited two very nice additions. The guests of this evening were very generous and so 2,024.00 EUR could were transferred to the Primavera account. Thank you very much - guests, organizers and BoJO - for this enjoyable spring evening!